Ghostwatch aired on UK television on Halloween, 1992. The premise of the show was that a documentary crew were carrying out a live investigation on a house whose residents had reported strange, paranormal activity from a ghost they called “Mr. Pipes”. Shortly it became apparent that Mr. Pipes was real, the house was definitely haunted and that the forces of the supernatural who resided within were malign, violent and just plain evil. The show ended with the studio practically exploding in paranormal activity as the hosts died were all driven mad or disappeared. But Ghostwatch forgot one thing: they forgot to mention that it was entirely fictionalized. The BBC was inundated with calls that were at first concerned and then angry. Yes, the people watching the show had no idea that it was a spoof. The backlash was so huge that the BBC had to air an apologetic chat show with angry members of the public who complained that their children, and even themselves, had been traumatized by the show, with some even contracting PTSD. In 2009 Chris Russo and Joe Rudy set out to create a rash of fake UFO sightings across New Jersey in order to expose the hoax and therefore the unreliability of most UFO sightings. They made sure to document their hoax at each stage so that later on they wouldn’t be branded as tools of some sort of Men In Black–style government cover-up. They set up in a small field and began attaching flares to helium balloons with fishing line, then set them all off and walked away. The next day, the media bit. The Morristown UFO sightings made both national and local news, parading a string of witnesses who made such claims as the crafts “traveled against the wind” and they certainly weren’t “man-made.” Even the TV show UFO Hunters, which appears on The History Channel, got involved and declared that the Morristown UFO could not have been caused by flares. After the short-lived Russian-Georgian war of 2008, we imagine no Georgian wanted to go to war with Russia again. So we can only imagine the immense panic that Georgians felt when turning on their TV sets in 2010, and seeing Russian tanks trundling into their country after Georgia’s leader had been assassinated. Georgians spilled out onto the street and desperately tried to contact their loved ones. The stress was unbearable to some, leading to hospitalization and in some cases death. But what nobody would notice until later was that the footage and headlines and clips military leader talking about war was old footage from the short-lived war of 2008, two years earlier. When Georgians found it had all been an ill-advised joke, they were not pleased. In the United Kingdom, 1976, at approximately 5:10 PM GMT, the news was interrupted by the distorted voice of a being who called himself Vrillon of the Ashtar Galactic Command. Vrillon went on to explain that he was a representative of an alien race who were on their way to destroy humanity unless we got our collective act together. This sent viewers who’d only wanted to watch some TV on a Saturday night into a frenzy. Police switchboards were jammed with callers terrified that the world was soon going to be Independence Day’d in a big way. One woman was apparently so scared she wouldn’t believe that the world wasn’t going to end until the police came out to her house to personally assure her that it was all somebody’s prank. And of course, it was a prank. Someone had managed to hack the signal in order to carry their message, and to this day, no one knows who it was. Nothing much ever happens in Sitka, Alaska. Except snow. They get lots of snow. But one day, smoke began pouring from the tip of the dormant volcano, Mount Edgecombe, that dominates the skyline. Understandably, that got pulses racing. Residents poured into the streets to catch a glimpse of the thing that would surely pour liquid fire and death into the sky any moment. The coastguard raced to the peak, only to find that what was actually in the crater was a pile of burning tires and the words “APRIL FOOLS” in fifty-foot letters. It was the work of Porky Bickar, a local prankster. He’d hired a helicopter, most likely at great expense, to carry the tires to the peak, set them on fire after writing his message, and retreated to a great distance to admire his work. Apparently, years later he received a letter telling him he’d gone too far after Mount Saint Helens exploded. But we don’t think he was responsible for that one. We hope. Alternative 3 was originally intended to be shown on TV in the UK on April Fool’s Day 1977. It was dressed up as a genuine science documentary about climate change that uncovered a bizarre conspiracy about a coming event that would make Earth uninhabitable. If the show had gone out on April Fools Day, people would most likely twigged on to the joke. But it didn’t, so large swathes of people actually believed that the world was going to end. Soon. Despite the fact that many of the people in the documentary were well-known actors, the television station received hundreds of complaints demanding to know when the world would end. Trolling is older than the Internet. Much older. In 1926, a spoof radio play written by a priest about an anarchist revolution taking place in London was broadcast by the BBC. The story was told in the style of fractious rolling news reports. The problem was that this was 1926, and nobody knew what factious rolling news was. Or what a spoof was. And it was only a decade or so after Russia had risen up against its leaders in a similar way, causing the sort of murderous chaos nobody wanted to experience a second time. Basically, nobody got it. And they weren’t really supposed to, as the broadcast interrupted a genuine discussion about 19th century literature. And so, when people were told that anarchist mobs had seized London and desperate pitched street battles were being fought, they believed exactly that. When they were told that Big Ben had been blown up, and that government ministers were being lynched in the streets, they got really, really scared. Radio stations and newspaper offices were inundated with frightened callers asking when the Navy would launch their counterstrike and if the King and Queen were safe. People who didn’t own radios were even more terrified, getting the news second-hand through Chinese whispers. In November 2006, someone noticed a strange LED panel in Boston displaying a tiny pixilated man raising his middle finger. The person called the police who, upon investigating the suspect device, called Homeland Security. By this point, an army of emergency vehicles had arrived. The mysterious device was thought to share some characteristics with an IED (an improvised explosive device,) so it was safely destroyed with a controlled explosion and that should have been that, until it was found that there were several more throughout Boston — on the sides of buildings, underpasses and alleyways. Eventually, after millions of taxpayer dollars were spent locating and destroying the panels it was found to have been a prank carried out by a marketing company hired by Adult Swim to advertise the show Aqua Teen Hunger Force. The two guys responsible went to court and, when confronted by reporters who demanded they apologize, stated that they wanted to talk not about the huge, terrorist scare they’d caused, but the proliferation of 70’s haircuts. $2 million was paid, half to the Boston police and half to Homeland Security, and the then-head of Cartoon Network resigned over the incident. In 2010, a Jordanian newspaper published a story that stated a UFO had landed in the desert, emitting an EMP pulse which took out all the electronics in the surrounding area, causing residents to panic and run. The UFOs passengers then disembarked. Inside were terrifying ten-foot-tall aliens. The major clue that this was a fake story was the date of its issue: April 1st. Unfortunately the small town of Jafr wasn’t in on the prank. Students were too scared to go to school, their parents themselves were terrified, and the Mayor took tactical action, sending a security team to search the area for the aliens. According to one security official who preferred to go unnamed, they were very close to carrying out an emergency plan that would have seen Jafr evacuated. All 13,000 residents. The paper apologized profusely, and we can see why. We also wouldn’t want the sort of man who picks up his guns and runs toward an alien invasion mad at us. 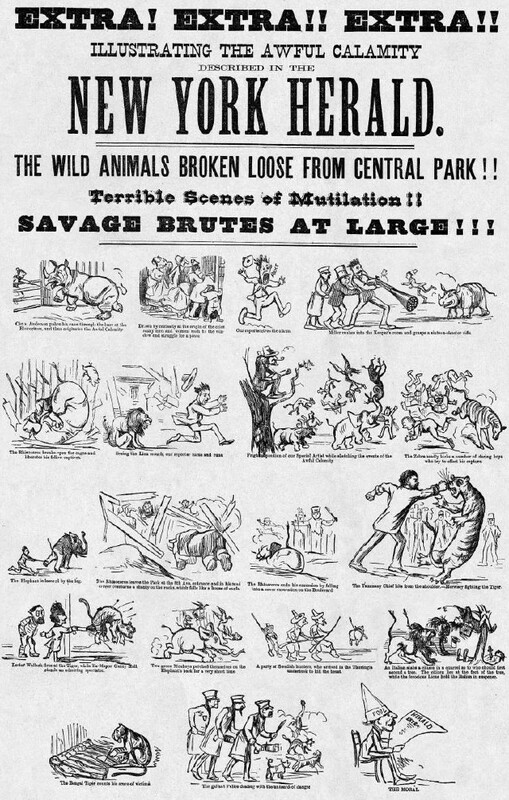 On the morning of November 9th, 1874, New Yorkers woke to a somewhat disturbing headline in the New York Herald which read, “Awful Calamity: The Wild Animals Broken Loose From Central Park.” To hear the article tell it, the streets were overrun with vicious, deadly animals which the National Guard, who’d been called in to contain them, were struggling to control. The streets were full of carnage: 49 people dead and 200 injured. Except, of course they weren’t. It was all just a prank. The article even carried a disclaimer stating as much at the bottom. But a large proportion of people who’d read the article stopped reading and started panicking long before they came to the disclaimer. Men grabbed their guns, the police were mobilized, and kids were withdrawn from school. Even the Herald’s own war correspondent, a man who should have known more than anybody that it was a prank, turned up at the zoo sporting two revolvers in his hands ready to fight. That Mooninite prank was priceless. As a fan of the show from the start, I couldn’t figure out how so many people didn’t know about the ATHF. I man who put tires in the volcano is a GENIUS. We should worship this man.